The castle of San Michele was located in the south-west of the town centre of Ascona, on a steep rocky promontory. The castle possessed a relevant extent of a rectangular shape with nine floors. The parameters of the caste were approximately the following: 130m by 50m which is about 6'500 m2. But all just part of the assumption! The true dimensions of the castle have been gone with the wind of the centuries. At present, at this historic place, private homes and the Church of Ascona have been built. The old church still has some parts of the fundaments based on the former walls of the castle. Sadly, for many tourists and history enthusiasts, there is almost nothing left to see today from the original castle of Ascona. Nevertheless, the historians agreed that the castle of Ascona existed. As a matter of fact, it was mentioned for the first time in 1189. It belonged to the Duni family. The castle had been offered by the Bishop of Como, Anselmo Raimondi, to Pietro Duni who was a notable military commander. To date, it is not possible to say with confidence wether the castle was involved in the harsh war between the Guelfs and Ghibellines, or wether it was attacked by the Swiss Confederate troops around 1500. But most likely, it was simply abandoned at the time when the Duni's lineage stopped. The last member of the Duni clan was Giovanni Pietro Duni who died in 1690 and was buried at the Church of Saints Fabiano and Sebastiano in Ascona. Beginning from that year, the Duni family was extinguished. To date, the primary architectural structures of the castle can been observed in the underground parts of the San Michele Church, which are situated in the Eastern part of the church. 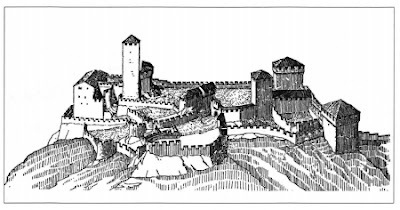 Like many for other castles in Ticino (for example, the one of Tegna on which we have already written), it seems that the Castle of San Michele could be founded before the Middle Ages. In fact, it could have rather a strategic position being situated at the entrance of a picturesque town of Ascona, above the lake, on steep slopes. This suggests that the castle could be settled and be used from the military point of view already from the Neolithic times (around approx. 3300 B. C). Many studies held by Johann Rudolf Rahn 1890, Giorgio Simona 1914, Emilio Clemente 1974 were done on this castle. They attempted to investigate and determine the size of the castle. The most pertinent study was done by Max Alioth in 1949. He used sketches and paints of the past in order to suggest a visual reconstruction of the castle. Max Alioth (1883-1968) was originally from Basle but lived in St. Moritz, Switzerland, being well known for his research skills. Alioth's drawings of 1949 showed a fairly big castle that was as large as the castle Montebello in Bellinzona. It is interesting to note that the Castle of San Michele was one of the four medieval settlements of the town of Ascona. Let us name them all: San Michele, San Materno, Griglioni and Carcano. The promontory of San Michele is accessible only on foot in the town of Ascona. The church of San Michele (rarely open) was conceived by Giovanni Battista Serodine and erected in the mid-17th century. We should say that the church was builded on the foundations of one of the corner towers of the ancient castle.